We had a church game night last night and my whole family went. I am some what an anti-social person I like being in big groups but I like to be by myself and just people watch. So I went but I took a new knitting project with me to work on I started the project right before I went. Meaning I cast it on and did two rows. The pattern is Victorian Neck Cozy by Wendy Johnson it is a free pattern so if you like it you can make it too. 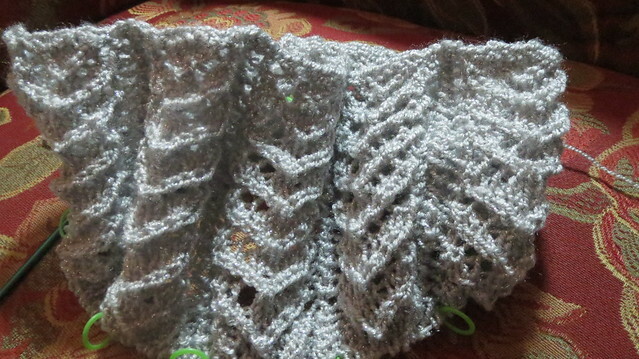 I am using glamor size 2 yarn. If I did this again I would go down two sizes in knitting needle for the neck area as this yarn is real stretchy and end sup too loose I think but I am fine with slouchy collars so I will not be frogging this. It is hard to tell in the photo but this yarn has a metallic fiber in it and has sparkle. I have not posted much in the last few days as I was doing a sort of repair project for a customer. 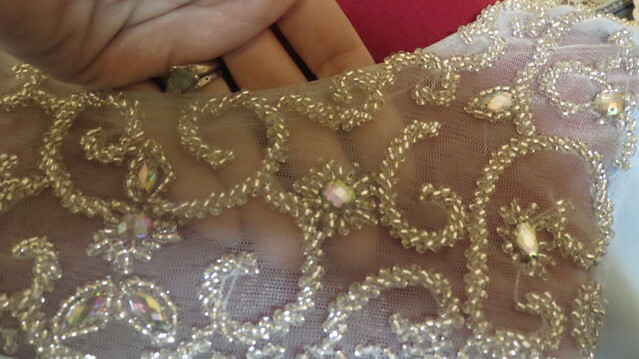 Taking a formal she bought on the Internet from China with no sleeves and a see through back and a long train. 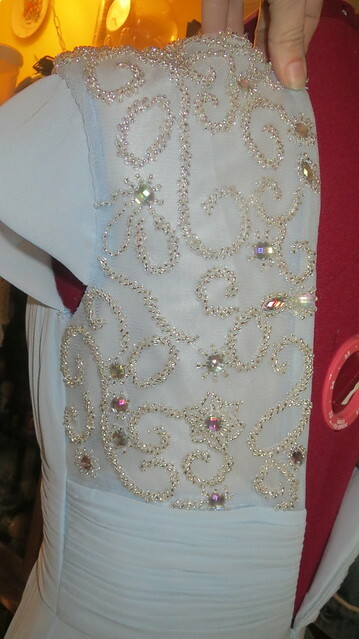 I cut the train off made sleeves and lined the back. 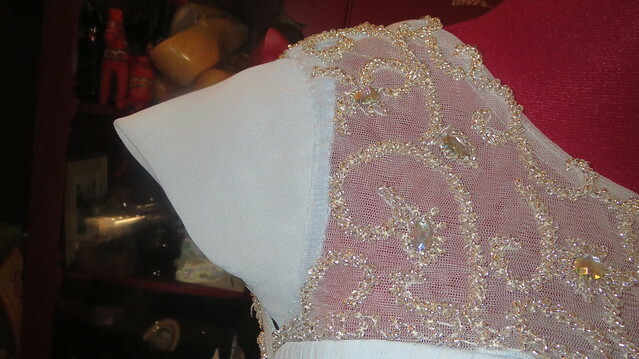 You can see in the photos where the front is see through above the bust area the entire back was that way and no sleeves. So the process of cutting off the train made it easier for the girl to wear and not have her hem destroyed plus it gave me fabric that matched the dress to make the cap sleeves and to make the liner for the back of the dress. For got to take a picture of the before. 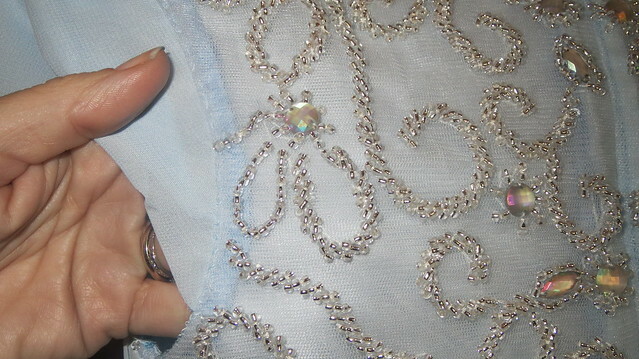 But here are some afters that do show the sleeves and the see through area in the front. The dress is too small to fit my dress form thus the reason I do not have it zipped up but you can still see the area that I filled in with a liner. 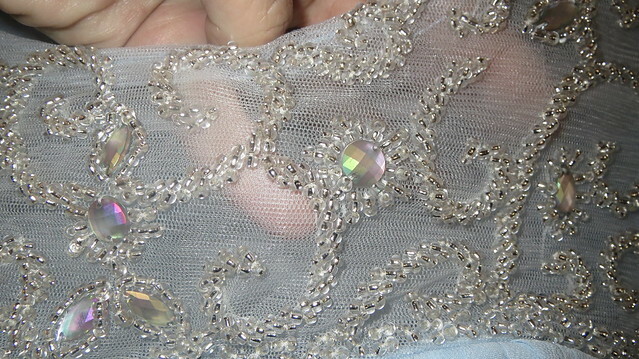 Because if the bead work I ended up having to hand sew the liner and the sleeves to the dress and I did two rolled hems by hand on the sheer over lay and the liner of the skirt. front with sleeve and you can see how see through the back would have been by how see through the front is. 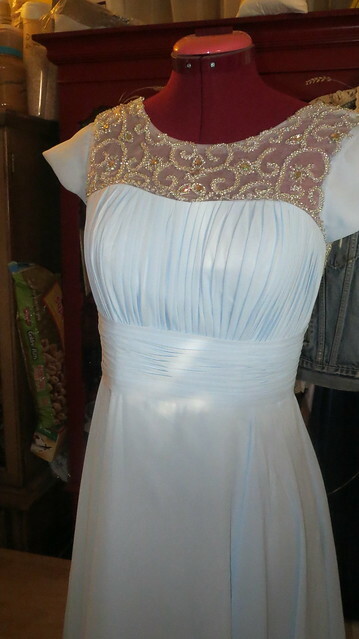 Now just to deliver it to the customer so her daughter can either wear it to preference or prom. I ended up redoing the sleeves to make them more of a flutter sleeve and a little looser. They looked better the second go round. 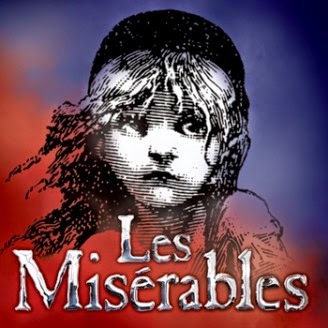 On a real happy note I get to make three jackets ( frock coats) for Les Misérables for a local professional theater "The Hale Center Theater in Orem". I am so excited to do this you can not believe it. 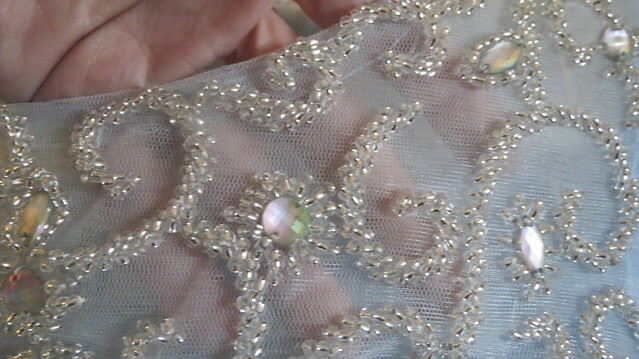 They are the design of the head costumer so I will not show photos of as I go as it is her concept. But after the show is in production I will show them. What I am excited most about is two are for Jean Val Jean and one is for Marius. I figured I would be doing people that are not main characters but this makes me excited and nervous all at the same time.